A new centre for people choosing to study higher education (HE) courses at college rather than university is set to be unveiled by The Duke of Devonshire. The Duke will officially open Vision University Centre – part of West Nottinghamshire College – on Monday (10 February, 2014) by unveiling a plaque inside the building’s main entrance at a ceremony attended by staff, students, dignitaries and representatives of the college’s partner universities. The college has spent £30,000 transforming the former Sherwood Care building at its Derby Road campus into a dedicated facility for its growing number of higher education students, such as those studying towards degrees or foundation degrees. Boasting classrooms, a study area, tutorial room, social space and state-of-the-art IT facilities and learning resources, the centre is aimed at providing university-level students with their own place to study and socialise while still feeling part of the college. It is also home to the college’s HE and international team to ensure on-site support and expertise. Refurbishment of the two-storey building took place over the summer. It has been open to students and staff since September. Dame Asha Khemka, principal and chief executive of West Nottinghamshire College, said: “We are seeing a year-on-year increase in the number of our higher education students, due to the high quality of teaching and the benefits of studying closer to home. “We recognise that those studying at university-level often have different needs and interests, with the requirement for research and autonomous learning, so it’s important to provide an environment which helps them make the most of their studies. Eleanor Taylor, head of HE and international, said: “The centre is equipped with everything students need for their course and the most exciting thing is seeing them enjoying the facilities we can now offer, such as quieter study space and a tutorial area. Their feedback has been hugely positive. The college, which has 522 higher education students, offers 23 university-level programmes from foundation degrees, full honours ‘top-up’ degrees, Higher National Certificates (HNCs) and Higher National Diplomas (HNDs). All are vocational, with a strong emphasis on employability skills. Its higher education provision is delivered in partnership with the University of Derby and Birmingham City University, who validate the programmes. 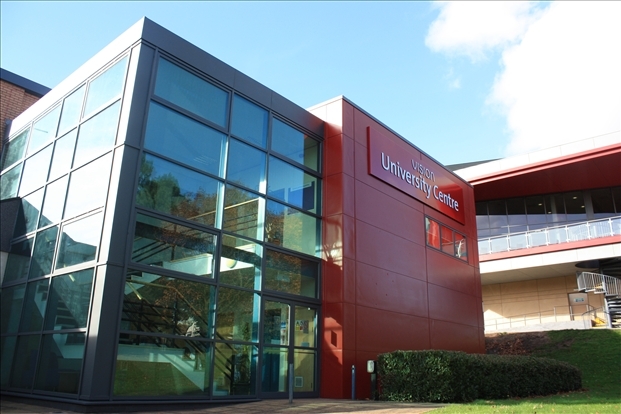 The Duke of Devonshire will perform the official opening of Vision University Centre in his capacity as chancellor of the University of Derby.